There's been some discussion about "girl cars," and what we can call them. One thing is for sure, Arnold Schwarzenegger would not be driving a "girly-man" car, because he needs something with POWAAA. 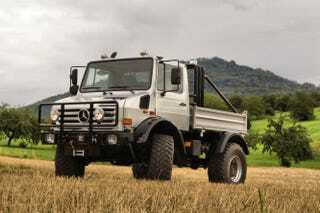 So if you fancy yourself an off-road action star, Arnold's Unimog is your's for the taking. The Mercedes Unimog is a strange beast. It's not luxurious or fast, but it is an over-engineered, mechanical masterpiece designed to tackle nearly any terrain. Schwarzenegger had this particular U13000 SE 6.4 custom built, and according to Road and Track, the chassis is a 1977 Unimog which gives it "historical" status in Germany. Power comes from a 6.4 liter turbo-diesel inline 6 with 320 horsepower and ALL THE TORQUES! It is also reportedly "street legal" in the U.S. The Unimog is listed for sale on Moble.de for 208,250 Euro (aprox. $270,000 USD). That includes: a winch with remote control, four-wheel parking brake, Hella high beams, air-ride seats, and an integrated four-person bench with seat belts in the flatbed. And it's signed, because Arnie just does that with everything he owns. If you need a military style truck to stomp through hills, rivers, trees or whatever to get you to the choppa! This is your ride...so what are waiting for, buy it! DO IT NOW!